Do you know the Christmas song, “I Want a Hippopotamus for Christmas?” The singer proclaims that only a hippopotamus will do—not a crocodile or rhinoceros. Well, I couldn’t find a hippo, but I did find an adorable rhino decked out in a winter scarf that I’m pretty sure will do for this month’s First Friday Giveaway. He is sooo cute. 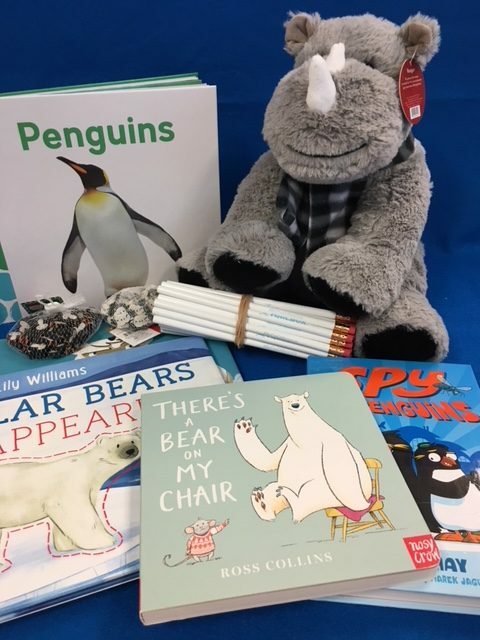 Along with Rex the Rhino, this month’s winner will receive 30 pencils, and an assortment of winter-themed mini erasers and books! So how can you enter for a chance to win this wintry prize pack? Do this! before midnight, December 16, 2018. “Frosty the Snowman”…”Please Come Home for Christmas”…”Mary, Did You Know”…I can’t choose just one! PS: CLICK HERE for a recording of “I Want a Hippopotamus for Christmas.” Be forewarned—the tune has a way of staying with you for a while! Congratulations to Stacey, the winner of this month’s giveaway! I love most all Christmas songs but guess my very favorite is, Mary Did You Know? Christmas is my favorite time of year and I love “Mary Did You Know?” I have had the opportunity to see the songwriter, Mark Lowry perform it at one of his concerts. Oh Come All Ye Faithful, my all time favorite. White Christmas sung by Bing Crosby. O Holy Night- one of my favorite Christmas songs that I enjoy playing and singing. Picking a favorite Christmas song is like picking a favorite student! “Deck the Iceberg” from Tacky’s Christmas by Helen Lester! White Christmas by Bing Crosby (love the movie Holiday Inn that he performed the song) and The Bells of St. Marys, also by Bing Crosby, also sung in the movie he starred in. I actually have 2. I love Silent Night because I used to listen to my granny sing it as she played the piano. And I love White Christmas because my nana gave me a love for old movies and White Christmas is my favorite. L love Mary did you know? Too many classics to choose from but Winter Wonderland is always a hit with young and old! The 12 Days of Christmas sung by John Denver and the Muppets! Merry Christmas everyone!! Mary did you know by Pentatonix. Such an amazing version. Colorado Christmas by the Nitty Gritty Dirt Band! Winter wonderland! But I also love Sleigh Ride, The Christmas Song and Joy to the World! Oh Holy Night, Celine Dion. ❤???? Mary Did You Know? ???? I love The Little Drummer Boy. Little Drummer Boy. It was always my mom’s favorite, and it’s a beautiful dong. BUT!! Nothing says it’s Christmas Day like Joy to the World! Disco Santa Santa Claus ~ sounds like the YMCA song by Village People but spells out NOEL! Oh Little Town of Bethlehem! Linus and Lucy from A Charlie Brown Christmas – Vince Guaraldi is a favorite of mine, but I also like Sleigh Ride by the Boston Pops Orchestra! My favorite song actually is “I Want a Hippopotamus for Christmas “. ???? we have heard on high! Here Come Suzy Snowflake and I’m Hard Rock, I’m Coco , I’m Joe. If forced to pick only one, The First Noel. jingle bells for the 2 year old class, baby it’s cold outside for me. I’ll Be Home for Christmas! Hands down! It always makes me cry!